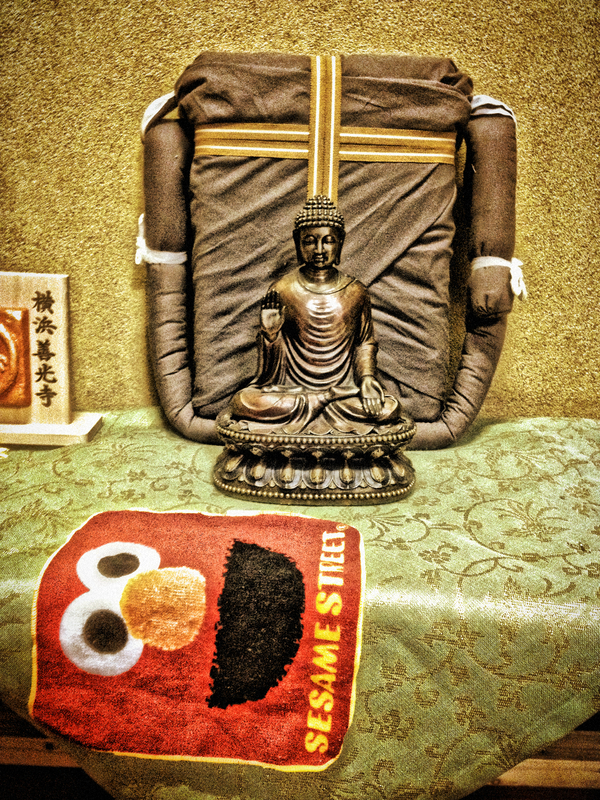 Our altar at home; our 3-year-old offered the Elmo towel. How do we orient ourselves to the world? When we face the center, where are we facing? What do we confront there? A temple is a space — any space — we create for the sake of practice. It’s where we allow the practice to play itself out, freely, without distraction. And at the heart of every temple, at its core, we find an altar, what in Japanese is called a shumidan (須弥壇). The dan itself means an altar; the shumi is a transliteration of Sumeru, the mythological, unimaginably tall mountain at the center of the world. According to Hindu and Buddhist mythology, the world that we know (the human world) is to the south of that mountain, but that is not the entire world. To the north, east, and west, lie other kingdoms, ruled by different kings; specific beings inhabit different terraces on the mountain’s slope; other beings live in the seas surrounding the mountain, and so on (for a fascinating read — and a headache — check out the Wikipedia page). Obviously, this kind of worldview is like saying that the earth is flat, or that corpses spawn maggots. We know better, and in the case of Mt. Sumeru, we’ve known better for a very long time. Yet this image of the mountain at the center of the world has continued as a powerful force in temple life for centuries. Just as we can make a temple of our current environment, so can we face a Mt. Sumeru as a way of giving direction to our lives. When we imagine an altar, we imagine a Buddha statue at the center. In reality, some temples replace Buddha with one of the bodhisattvas: Avalokiteshvara (the embodiment of compassion) or, especially in rooms where people practice zazen, Manjushri, the actualization of wisdom. In any of these cases, we are orienting ourselves to an image we find inspirational, to an exemplum of the practice. I have heard of individuals and Zen centers doing away with such imagery all together, replacing the Buddha image with something like a beautiful rock. I imagine that such a choice comes out of a concern about idolatry; perhaps such centers feel that a Buddha statue would just be too overtly “Buddhist.” Or maybe the goal is to align oneself with the natural world. Or it could be that the rock is intended to show that “everything is Buddha,” a teaching heard again and again. But I think this is a mistake. I will try to explain why. An altar is not just something that stands there. We engage with it, and the nature of that engagement is offering. At first we might just offer symbolically. Awkwardly. But with time, when we give something, we actually give it. We truly let it go, and in doing so, we discover that there is nothing to be lost. In Japanese temples, there are certain ceremonies in which sweetened water, tea, cakes, or even an entire meal are ritually placed on the altar as an offering to the Buddha and all beings. Really, it’s just “all beings” — the Buddha, dead now 2500 years, is in no position to drink tea. But that’s the shape of it. In the monks’ hall, Manjushri even has his own ōryōki set (one common novice mistake is to place the food facing away from Manjushri, when in fact it’s arranged as if he might actually lean down and take a bite). This is a rich kind of ritual, an opportunity to personalize our relationships with the teachers of the past, both real and mythological. How great to offer wisdom a bowl of soup! I suspect, though, that this particular kind of giving will never find a strong foothold in the West. It takes a long time for this kind of offering to start feeling authentic, like something other than play-acting. But this kind of offering is also not the most important kind. This kind of practice invites us to let go of what we think of as “mine.” And we can learn to make this a habit, elaborate ceremony or not. One of the most simple — and universal — practices in the Buddhist world is “giving it away.” If a friend gives you a sweater, you can hold up that sweater and say, “I offer this sweater to all beings—may all beings be warm.” And then, assuming that all beings do not descend upon you and take it, you receive it. But now, instead of receiving it just from your friend, you’re receiving that sweater from all of reality. Before we eat, we do the same, giving it away and receiving it anew — not as a gift to keep, but as a treasure to hold in trust. This is an act of generosity, but in equal measure, it is an act of humility. The altar becomes a physical vehicle of this process. When you receive a gift, place it on the altar, for an hour or a day or a week. When you receive your paycheck, place it on the altar before you put it in the bank. Feel the letting go intrinsic to that act; feel the responsibility that comes with it. In theory, we can do this practice anywhere, altar or not — and I think we should, as much as possible. But actually placing that sweater or that paycheck before the image of the Buddha and leaving it there — that is a powerful act. It is the enactment of giving, receiving, and gift, what we call the Three Wheels. It is this practice of enactment — physical enactment — that lays the foundation for being able to do such a practice instinctively and formlessly, altar or no altar, wherever you may be. To carry out just this universal practice of offering objects, perhaps an altar doesn’t need any image at all — no Buddha, no bodhisattva. But there’s more than this. We all have an idea of who the Buddha was, or what a buddha is. It’s usually at least a little superhuman; the fact that the Buddha has long been portrayed with exaggerated features (long ears, for example) doesn’t help us to see him as a person, though that’s all he was. We can hear over and over that the Buddha was just a human being, that he was just like us, but few really believe it. We might imagine him glowing a little, or assume he always knew exactly what to do, or believe that what he saw is beyond what we’re capable of seeing. However, the gap between our projections about Buddha and his actual humanity mirrors perfectly the gap we ourselves feel between who I am and the immeasurable scope of who I might be. It is no exaggeration to say that reconciling this perceived gap is the singular aim of Buddhist practice. It is a koan — a question we confront and which confronts us — and rather than avoid it, we are charged with facing it head on. If the image on the altar is a beautiful stone, that presents no challenge. It may feel a little silly at first to bow to a rock, but we can get over it, because by choosing an abstraction, we can make that rock whatever we want it to be. We can each individually create our own story about that rock, one that is non-threatening and safe and personal. But spiritual practice—Zen or otherwise—should never be so comfortable. There’s the famous saying, “If you meet the Buddha on the road, kill him.” I think this is commonly misunderstood. Erasing Buddha and images of Buddha from Buddhism (or in another popular scenario, removing Buddhism from Zen) is not killing Buddha. It’s more like putting out a hit. Or getting a restraining order. In order to kill Buddha, there must be an encounter on the road. We have to meet. In your home, set up an altar with a Buddha image and space for offerings. Let yourself be confronted by the image every day. Let it be a part of the air you breathe. Let yourself enjoy it and be bothered by it. Let it be the mountain at the center of the world, the landmark by which we know which way is forward. And bow to it. Bow, and in doing so, offer yourself up at that same altar. You will construct a story about this — that’s natural (and inevitable). You will tell yourself, “I’m bowing to the idea of the Buddha, not Buddha himself.” Or perhaps, “I bow to the Buddha as a student bows to a teacher.” That’s fine. It will change with time. If you keep bowing, then through that action, you’ll either figure out why you bow, or you’ll forget the question all together. But the story you make for yourself will never do that action justice. There are stories in Zen literature about teachers who, in order to show that the Buddha was not special, burned Buddha statues, or threw them away. I even read once of a monastery in Sri Lanka where the Buddha’s image was printed inside urinals, to the same end. In cultures where Buddhism is long established, and where the Buddha is sometimes accorded god-like status, such transgressive actions become profound and powerful teachings. But in the West, we like those kinds of stories too much for them to be very meaningful. These stories appear again and again in Western Zen literature. We smile knowingly when we read them. We love what those teachers did, but we have to remember that those teachers did those things in front of students who were horrified, not thrilled. That was the point. I think most of us need the opposite, to be confronted directly by the image of Buddha and be forced to ask — again and again — What is this? Different patients require different prescriptions, and in the West, we need to look the Buddha in the eye, have that stare-down, maybe wrestle with him a little. Then we can kill him. This entry was posted in Uncategorized and tagged altar, buddhism, kill buddha, koun franz, sumeru, zen. You’re posting an impressive amount here! I think you’re dead-on here about the central koan too and bowing and Buddhas too. Thank you. Your story about Katagiri-roshi reminds me of another little nugget from Altars 101–that the flowers are the Buddha’s clothes, the candles his eyes, and the incense his food. So he really does seem to subsist on smell! Hi. Good post. i agree with your point about Westerners liking “kill the buddha” too much. i am probably one of those. but on the other end of the spectrum, when does bowing to an alter become attachment to the alter? is there a middle way for this also? Thank you. My feeling is that attachment to the altar is something that happens at the first part of the process–without a little of that, there would probably be no altar at all. That’s natural. But the more we do something, the more three-dimensional it becomes for us, allowing us to let go of our little story about it. It becomes ordinary. One winter, a local guy came to the monastery and dropped off a full truckbed full of daikon (Japanese radishes). So that’s all we ate, three meals a day, for a month. We kicked off that month with aversion (just attachment in reverse, same thing), but as the days passed, we developed a really playful relationship with daikon. We started to see that you could do a million things with it. We could let go of the story of “this again?” and move to seeing that even though it’s daikon every day, every day is different, and so, by extension, is each daikon. We ate hundreds, and when we ran out, we were all sad to be done with them. That’s intimacy, and the main ingredients for establishing it are time, proximity, and a lack of options. One of the basic benefits of monastic life, in my experience, is that everything is like this. I didn’t need to build an altar and then develop a disciplined practice around it, then choose to stick it out and work through my relationship with it. Just by following the schedule and doing what I was told, I was in relationship with multiple altars all the time, every day. That contact time and that friction are built into that life, so it wasn’t something I had to create for myself. I feel grateful for that–I know it can be difficult to take up these kinds of practices at home. But I still think we should, and can. I’ve often wondered how the notion of ‘killing the Buddha’ squares with the first of the Ten Grave Precepts, and wonder too how that Precept relates to our attitude to our own thoughts and assumptions about the Buddha and ‘killing’ him. ‘Killing’ the Buddha, understood a certain way, seems too extreme, like an act of violence on our own thoughts. I think the approach may be contrasted, in terms of zazen practice, between trying to pummel ourselves into a state of not-thinking, and joyfully engaging with our own unfolding via non-thinking. Thus the Buddha can liberate himself as we meet him again and again on the road. I think that “killing” Buddha is a way of talking about “getting over” Buddha–in that sense, I don’t think it’s an act of violence so much as an act of letting go. There’s a famous story about a monk in the kitchen (I don’t remember who–someone important) who “met” Manjushri. Manjushri appeared suddenly, floating over the soup, and the monk just grabbed a big spoon and started beating him, shouting, “Get out of my kitchen!” The specialness of that encounter didn’t bother him; he didn’t put Manjushri on a pedestal. Someone was interrupting his work, so he told him to leave. Killing Buddha, in a Zen sense, is very much in that same vein, I think. Your posts are most enjoyable and very welcome. I certainly respect your and others’ feelings that you find that a statue of ‘buddha’ on the altar is the most moving and ‘best’ thing. But when you say that ‘if the image on the altar is of a beautiful stone, that presents no challenge” I think it is important to remember that you are speaking from your own personal experience. I think the ‘best’ way to design an altar is in a way that engages us, moves us, inspires us, challenges us, as you say. Many of us are not at all inspired/engaged/challenged/moved by a statue of ‘buddha’. Many of us find a beautiful rock, a picture of a forest, or animals, or a human ‘hero’ or ‘heroine’, or even a bowl of water, etc. to be far more profoundly challenging/engaging/inspiring/moving. Whatever reminds us of our committment to all beings, compassion, awareness, effort, openness, and inspires us to open, let go, soften.. that is what I think we ‘should’ use on our ‘altars’.. Thank you. I certainly agree that there are different shapes this can take. I’ll only add that, in my experience, there’s always a real risk that the altars we build will, inadvertently, become altars to ourselves (in reflecting a highly personalized and selective vision of practice). Using a buddha image as a default is at least one way to counteract that very powerful tendency. In reponse to the comment about the monk who met Manjushri, i wonder what would have happened if his reactions rivaled these guys. In my experience, altars with buddha images on them can just as easily become altars to ourselves as can altars with rocks, or images of nature, or pictures of Thich Nat Hahn or Mother Teresa. Lots of people really cling to buddha images, and invest them with all kinds of highly personalized stories, and use them to cling rigidly to a highly selective vision of practice. But whatever helps each of us most powerfully to “Wake up!”, to me it makes sense that that’s what we should use.